Project 1612: Can you give us a brief overview of your work individually and collaboratively. Kevin: Most of my writing is done is very short form, be it a collection of poems or a stand-alone short story. I’m a devout follower of Jefferson’s quote, “The most valuable of all talents is that of never using two words when one will do.” I work to distill a piece to only the most honest, valuable words. In working with Brandon, I’ve found he takes a similar approach to his visual art. Regardless of the style of a piece, he takes great care to include that which is invaluable and to avoid that which is simply wasted strokes. It makes for a comfortable and cohesive collaboration. Brandon: Independently my work tends to deal with the juxtaposition of the micro vs the macro. During my undergrad I started exploring visuals under a microscope and then building those textures up on a larger scale to represent something more cosmic. Collaboratively we tend to play off each others own themes to find a medium balance. Project 1612: Considering you both live in Peoria, have you shown work in the area before? Brandon: Neither have I, besides some student exhibitions. Project 1612: As local artists, you were able to come visit the space a couple months before your exhibition. Did you stick with your initial plans or alter them once you started making the work? Kevin: Although the content of the work itself stayed pretty much the same, we did work with the layout of the space to find a great pattern for installation. The two-directional, sequential flow of the project worked perfectly within the symmetrical box that the space provided. It forced the viewer to walk through both sides of the story independently while still seeing them in concert inside four walls. It allowed us to use one central starting point with two equidistant paths in a clean way. Brandon: The theme remained the same, but the overall execution changed a few times between discussing/viewing/ and eventually setting up the show. Project 1612: This was more of a collaborative exhibition. Can you talk more about the content of the work and how you made it a collaborative effort. Kevin: About a decade ago, my mother was diagnosed with Parkinson’s Disease, a neurological disorder that has no known cure. It’s been something of a nightmare to watch it progress over the years, but it’s also proven to me what role someone’s attitude plays in life. There are days where her willpower, grace and kindness are strengthened by how she decides to live with the disease. There are days, too, where it breaks her. I wanted to illustrate the effects on the mind that such a diagnoses can do. The viewer starts in a central point and takes one of two paths. One path dives deeper into madness, the loosening of reality that can creep into your heart if you let it. The other path moves up and into hope with acceptance and bravery being the catalysts for that type of progression. I wanted to include both paths in one piece to give the viewer the sense that, on any given day, you can find yourself on either path. Both sides live within one brain. And as with the choice of path the viewer takes, so, too, does a person living with a terminal disease. Brandon: Kevin really took lead on this project, I know the subject matter was really close to him personally. I felt where I could strongly contribute was to visually display his words, and illustrate the scenes that he and his mother were dealing with. I had done a study a few years back where I had sketched hundred of pages of chaotic, organic lines. I knew immediately that this matrix of neurons would be a perfect foundation to this overall theme in exploring the connections between the brain and then metaphysical. Project 1612: Have you worked collaboratively before? And have you continued to work collaboratively since Project 1612? Kevin: Brandon and I have worked together in a professional and casual setting for a number of years, but this was the first time we completed a fine art project together. We have continued to work together since Project 1612 on various video projects. Brandon: As Kevin stated this was the first time we’ve applied our partnership to a fine art setting. We have several video projects we have completed and are looking to complete in the future. Kevin: This was frankly the first time I had ever shown my writing to an audience outside my family and close friends. As something of a bucket list item, our residency at Project 1612 gave me a sense of completion by showcasing my work in a public forum. I’ve continued to write personally since Project 1612, but have yet to work on another exhibition. Brandon: Since 1612 I’ve started looking into expanding the mediums that I work in, and ways to display that. Professionally I work in video and graphic arts, but I have tried now to develop different audiences and work then my usual 9-5. Project 1612: Do you have any projects you're currently working on or any upcoming projects we should know about? Brandon: I’m currently working on two short films that I would like to start production on by the end of the year. I’m also working on a few short video pieces. Nothing in the way of printmaking, besides some personal work here and there. Sara: I am a painter, sometimes photographer and filmmaker. I did not paint really between the time I finished my BFA in painting (1989) and 2006, after I had to move all my artwork from college out of my mother's attic. In 2008, I decided to return to working on a project about my parents' marriage that I had started in the early 1990s. My father passed away in 2005, and I think that his being out of the picture allowed me the mental space to pursue a number of ideas that had been in the back of my mind for a long time. Sara: I am always scouring the Chicago Artist Resource website calls for work. I was intrigued with the idea of creating a temporary installation using paint, as I had never worked that large. I decided to apply as I was curious about how this project (1612 art space) would work. Project 1612: Once you were accepted, how did you initially plan to utilize the space? Sara: Initially I made a number of scale drawings on the computer so I could try to really visualize the space. In early conversations with you, I was thinking in terms of a way to include screening my documentary but I realized that would not work logistically because of the lighting situation. I also was thinking in terms of portability and re-use. I considered the idea of priming tarps to hang and paint on, but that seemed like more work than benefit ultimately. I decided to bring some large self portrait woodcut prints that I had done in 1988 and had started playing with (cutting, collaging) in 2012. They had the benefit of scale and portability. Media was a big issue as I usually work in oil, which was not feasible for the space. I consulted with a friend who had done some mural size interior paintings and he suggested house paint. So, I put out a call on Facebook to friends and acquaintances who might have old house paint that they did not want. I had a terrific response and ended up with over 50 colors and plenty of shades of white. I spent a significant amount of time organizing the paint and transferring it to translucent containers with screw top lids for easier access. In addition to the woodcut prints, I decided to bring a few of my paintings to hang and create larger contexts for. Ultimately, I did not have a sketched out plan, but brought enough resonant pieces with me to create a space story. Project 1612: During your time at 1612 you really took advantage of the wall space. Have you made work like this before or was this the first time? Sara: For my BFA, I created a photo based installation called "Being At Home", which incorporated rotating slide projections of my documentation of family over the previous 4 months. It also included a mass of photo-collages and xeroxed copies of old photos as well as furniture. I painted the walls colors that I associated with our home: bright yellow for the kitchen and green for the hallways. 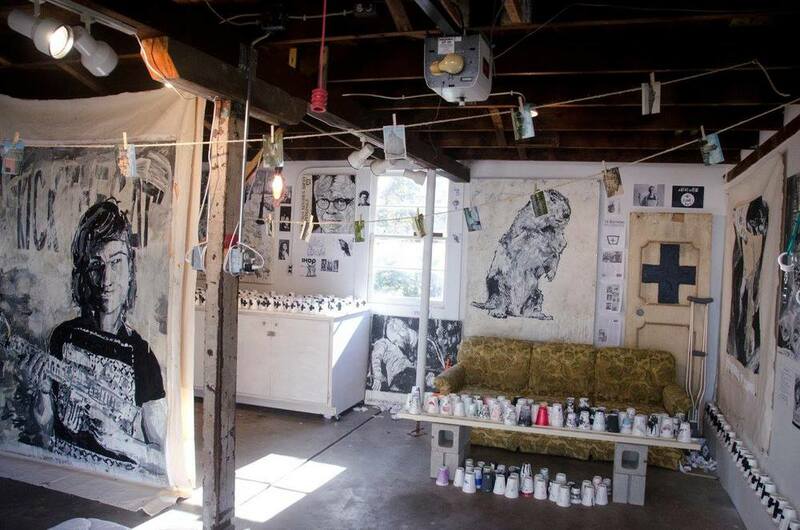 It was, in words of my aunt Katherine "a big mess of stuff”… Through my MFA program I worked with installation incorporating family narratives (history being an objective term) and lots of (emotionally laden but undigested) 'stuff'. For my MFA, I created another set of rooms delineated by, similar to "Being at Home”, wall color, though the artwork itself was primarily written and visually austere. So, in many ways, this kind of installation was new - creating some work on the wall itself rather than bringing a lot of stuff in to a context. Project 1612: Have you continued working this way after 1612? And in what ways has this experience influenced your work? Sara: I think that coming to 1612 gave me the confidence to try thinking and working on a larger scale again. I am contemplating doing more large scale prints and have started working on large scale (6' x 6') canvases and recently primed a 12' x 15' tarp to experiment with the idea of a large scale collaboration with a friend and fellow painter. Public Art does not seem like as scary a concept as it did to me previously.